I spent some time researching the early congregants of Grace Church in New York City (where my choir, the Choral Society of Grace Church, sings) looking for good stories. Some of the pews in the church have plaques with names of the people who once owned them, (they bought pews in those days) and these former owners turned out to be a virtual who’s-who of New York society at one time. There’s a Schermerhorn pew, #106. It’s right in front, next to the rector’s pew, essentially the best buy-able pew in the house. Abraham Schermerhorn snapped it up for $800 in 1846, (about $20,000 in today’s dollars) and that’s when I learned that Caroline Webster Schermerhorn, who went on to become the famous The Mrs. Astor, was a congregant here when she was a girl. 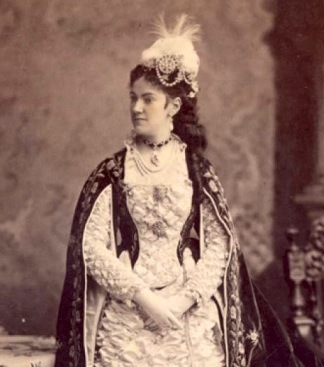 For those who don’t know, Caroline Astor ruled New York society in the 19th century. (Read The Age of Innocence, by Edith Wharton. Wharton’s grandmother, Elizabeth Jones, had a pew at Grace Church.) For some reason I had a hard time finding out for sure exactly what day Caroline was married and where. William Astor, of New York, Gentleman, aged 25 Years and Caroline Webster Schermerhorn of New York, Spinster, aged 23 Years, were married by me at Grace Church this the 20 day of September 1853. I guess “me” would have been Rev. Thomas House Taylor, the rector at the time. Anyway, I thought I would put this out there in case someone else comes along looking for this information and, like me, has trouble finding it. Here is Mrs. Astor. It looks like she didn’t worship at Grace Church as an adult, however, at least not as far as I can tell. Perhaps because they moved uptown. It’s amazing how important your place in the New York aristocracy was, and I guess still is. But in one of the books I used to research the history of the Church and the neighborhood, Grace Church and Old New York, by William Rhinelander Stewart, he lists every important person who lived in the neighborhood at the time, and exactly where. Basically everyone who was anyone. It was written around the same time as The Age on Innocence. Update: I found this great description in The Age of Innocence of the chancel steps I climb for every performance. The stone in the Church is imitation! It’s actually plaster, which has been known to rain down on us sometimes while we sing (they’re undergoing renovations). But what an incredible sentence. I, of course, have a different feeling whenever I stand on a chancel step. I’m closer to every other bride who has ever floated up there. 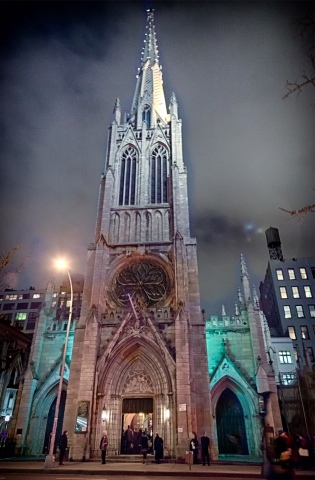 The amazing, supernaturally beautiful picture of Grace Church was taken by David Jelinek. Well, it’s certainly nice to start out the new year with a compliment about my new book!! Especially after the day I had yesterday! (Computer hell.) Thank you so much and welcome to my blog!! I use exclamation points a lot. You’ve got me finally reading the Age of Innocence (on these chilly nights) and I’m really moved by it. Thanks Stacy.